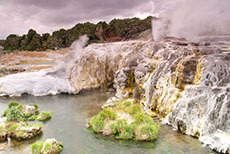 Take a tour to Rotorua to witness the spectacular geothermal activity and learn about Maori culture and history. 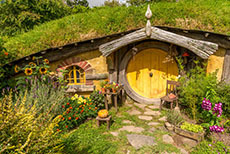 Take a tour to see the real Middle-Earth at the Hobbiton Movie Set. The setting for The Lord of the Rings and The Hobbit Trilogies boasts 1,250 acres with picturesque views. Learn about the Maori culture at the fascinating Te Puia Thermal Reserve, home to a re-creation of an early Maori village, the magnificent Pohutu geyser, boiling mud pools, and the National carving and weaving school. 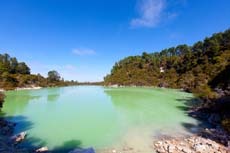 Journey out to see the spectacular nature at New Zealand's most colorful natural volcanic area. 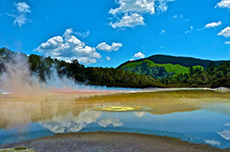 Some great places to view are the unique Champagne Pool, Sinter Terrace formations, Steaming Ground, Bubbling Mud, Expansive Vistas, Huge Volcanic Craters. Walking trails wind around and lead up to the summit of Mount Maunganui. The summit walk takes about an hour and gets pretty steep near the top. The Mauao Base Track will take a little less time and wanders along the water and through groves of pohutukawa trees that bloom November through January. Most walkers first head to the trailhead at the end of the road running behind the waterfront RV park, but there are also other easily found starting and ending points. Sandy and wide Mount Beach is within walking distance of the Mount Maunganui port, and it's well-known for surfing. There's a sand beach, swimming and a variety of water sports options, lessons and rentals that range from surfing to paddleboarding and kiteboarding.